This clickable system makes student assessment fast, flexible, and easy. And, your students might even enjoy tests and quizzes when they get to use this fun, yet functional technology. Create tests with custom or standardized content, and get results in real time, or save it for reviewing whenever you like. Lead tests yourself, or let students pace themselves. 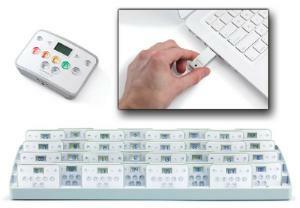 Simply hand each student a clicker and begin your test. The software automatically configures the clicker buttons students need for each test, and the handheld devices are easy to understand. Intuitive option buttons let students select a number for answering multiple choice questions and more. The MimioHub wireless receiver integrates automatically with the MimioVote system, allowing it to send data instantly to your computer, so you can chart your student's progress at anytime for clear achievement records. When class is finished, simply return the handheld units to their recharging tray and they will automatically renumber themselves. Student assessment will never be the same again! Choose from a set of 24 or 32 MimioVote rechargeable handheld devices, packed in a durable metal storage case with foam-padded compartments. Each package includes removable docking and charging station, MimioStudio™ software on DVD, MimioHub wireless receiver, power supply, and cable. System comes with a 2-year warranty extended to 5 years on all hardware components except batteries, with online registration. Unlimited lifetime on MimioStudio software. 90 day warranty on battery.